He suffers from a weakened heart and has come home from the hospital to die. Many of you know him from the Lions Club, or saw him at the bank or post office, or were lucky enough to have your name cut out of wood by him for your desk. His name is Don Billings. I’ve been taking care of his personal matters, paying his bills, getting his affairs in order. In his safe deposit box from the bank I came across his diary from World War II. I read it with great interest as he never told me much about that time of his life. On this Thanksgiving day, I have many thanks: my wife, kids, and my father. Even as he lays dying, I’m thankful for this time with him. As I read his journal, I don’t see the frail 83-year-old man in the bed, but I see a brash 22-year-old serviceman dressed in his olive drab uniform cutting a very dashing figure. A man with his whole life ahead of him, but living day to day. I can’t help but think of our many young people in uniform overseas today doing exactly what my father did when he was their age . . . defending our freedom. “The stillness of the night was broken by the door of the Nieson hut being opened. It was the squadron charge of quarters coming to awaken us. “Once more we arose and dressed quickly, then walked half a mile to the mess hall for breakfast. From the mess hall, we were picked up by trucks and taken to the briefing room. “Presently the briefing officers arrived followed by the two chaplains. ‘Our mission this morning will be an airport located at this spot,” said the briefing officers pointing at a place on the map called Munich, Germany. “Immedidately the room was filled with the usual moans and groans. After the briefing officer was finished, he was followed by the lead navigator and then by the lead bombardier, then followed by the two chaplains who led us in a prayer. “From the briefing room we walked over to the locker room stopping by the American Red Cross doughnut truck to indulge in sinkers and mud. “Arriving at the locker room we lined up to check out our blue beetle suits. These were the electrically heated suits and looked like a pair of blue long-johns. After buttoning, zipping, tying, and strapping equipment to us, we all piled onto trucks and were hauled to our bomber. “At the aircraft, the crew chief was giving her a last minute check and the armorers were loading 500 pound oil incendiaries in the Bombays. “Presently the ‘Start-em-up’ flare was shot off by the control tower and the air was filled with the noise of B-24’s starting their engines. Then the first bomber rolled past followed by another and another. Finally came our turn to taxi out. “We were flying in the old ‘Iron Corset’ this morning. Her number was 318 and her call sign was B Bar fro Baker. She had 36 missions and four enemy aircraft to her credit. “The takeoff was uneventful and then the climb through the overcast began. This lasted for 12,000 feet. Our bomber almost collided with another B-24 on the way up. Then upon breaking out was the nice, warm sun and hundreds of bombers flying around in a scramble, each looking for his group. “We finally found ours by the red-red flares being shot up by the lead ship of our group. After everyone was in formation, we started out on course. “The flight to the target was uneventful except when I broke the monotony by asking the navigator when we’d be out of England. He told me that we were alread 200 miles into enemy territory. “Arriving at the I.P., the bombardier asked me to open the bombay doors and told the waist gunners to start throwing out chaff. Then the flak began. The Jerries were throwing everything they had at us. They started tracking us with their flak burst and we could see the flak getting closer and closer. Finally we got a burst directly under us. The ship dropped off on its right wing and started to do a flat spin. Then the pilot brought it unders control and straightened it out. “One of the 500 pound bombs bean leaking and the bombardier salvoed the whole load. Nine bombers behind us saw us drop our load and dropped theirs, thinking we were over the target. “All this time the pilot was very busy trying to keep the aircraft under control. The left aileron cable had been shot in two and the supercharger on engine number three was shot out. It had to be feathered. Five gas tanks had been punctured and gas was running into the bombay’s. I thought we were goners as the slightest little spark would have blown the plane to pieces. I managed to open the bombay doors a couple of inches to let out the fumes and gas. With the number three supercharger knocked out, the entire plane started to vibrate. I thought the entire plane was falling apart. Duwe, the pilot, finally straightned it out. The self-sealing tanks soon closed up and the gas stopped leaking. One bombay door was shot off and the co-pilot’s windshield was shot out but he was uninjured. There were about a hundred other holes throughout the ship. By this time, we were out of formation and were flying alongside another B-24 from our group who was also lagging behind for some unkown reason. All of this time we were flying throught and dodging flak. “Then it happened, someone yelled ‘Bandits’ over the intercom, and we were attacked by ME 109’s and FW 190’s. Our tail gunner scared them off with a couple of bursts from his twin 50’s. Then the ME 109’s made a tail attack on the B-24 next to us and started pouring lead into the tail. While he was doing this, Healy, our top turret gunner went to work on the ME 109. His engine started smoking and he peeled off and bailed out. But not before he took out the B-24 next to us. It burst into flames and peeled off right across our nose, went into a spin and crashed. “We had to dodge flak all the way across Germany. 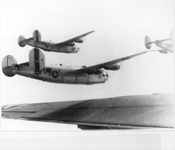 We met up with other stragglers and formed a group of bombers made up of B-24’s. I was riding in the top turret for a while so the engineer could check on our damage. Every way we turned, they would throw flak at us. We kept dodging from cloud to cloud. About this time the sky filled with more fighters, but to our relief they were P-51’s, P-38’s, and P-47’s. They started chasing the ME 109’s and FW 190’s away and in a few minutes they ahd the sky cleared of enemy aircraft. “After a lot of sweating and praying, we finally reached the channel and began to breathe a little easier. Now we started sweating out our hydraulic lines for landing. We were given priority clearance to land. Even with the hydraulics shot out, one aileron shot off, Duwe made a perfect landing.